Basic ring from three of it could be perfect for wedding. 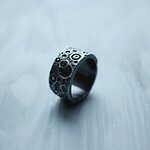 The width of rings is 2, about 3 and 4 mm, the price is 1200, 1400 and 1600 UAH respectively. 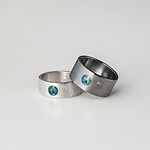 It is possible to make each separate Trinity ring of different textured surface.